A new bipartisan committee’s working group will gather on Capitol Hill throughout the coming months to find ways to improve electronic health records, according to Senate health committee chairman Lamar Alexander (R-Tenn.) and ranking member Patty Murray (D-Wash.). The group will work to find five or six ways to “make the failed promise of electronic health records something that physicians and providers look forward to instead of something they endure,” Murray said in an announcement. While adoption of EHRs has grown, many physicians aren’t satisfied with the technology. In a recent survey by Accenture of 600 U.S. physicians, only 46 percent believe EHRs improve treatment decisions and 64 percent believe they reduce medical errors. EHR adoption also appears to have leveled off, FierceEMR previously reported. All members of the Senate health committee are invited to be a part of the working group. Staff meetings begin this week, with participation from health IT professionals, industry experts and government agencies. Help providers improve quality of care and patient safety. Facilitate interoperability between EHR vendors. Empower patients to engage in their own care through access to their health data. Protect privacy and security of health information. The working group isn’t the only way Alexander and Murray are pushing for change when it comes to EHRs. Both spoke at a recent Senate appropriations subcommittee hearing of the Health Education, Labor and Pensions Committee regarding the Health and Human Services Department’s budget. The senators told Department of Health and Human Services Secretary Sylvia Mathews Burwell that, despite $28 billion in subsidies pursuant to the Meaningful Use program, physicians are not adopting EHRs as hoped. The Centers for Medicare & Medicaid Services has paid out nearly $30 billion in meaningful use incentives for hospitals and physicians to adopt EHRs. But some members of Congress, the body that approved those funds, are about as frustrated with EHRs as doctors and nurses. “The evidence suggests these goals haven’t been reached,” said Senator Lamar Alexander, R-Tennessee, in a long EHR hearing followed by Erin McCann, Healthcare IT News managing editor. Robert Wergin, MD, president of the American Academy of Family Physicians, said that family physicians are having a difficult time with the Stage 2 meaningful use requirements. The “time, expense and effort it takes makes it not worth while,” said Wergin. Indeed, some 55 percent of physicians surveyed plan on skipping Stage 2 all together. President Barack Obama’s Precision Medicine initiative hinges on gathering data from millions of individuals, but there are challenges the healthcare industry will face when it comes to collecting that information, says Niam Yaraghi, a fellow in the Brookings Institution’s Center for Technology Innovation. The first problem is the inability for electronic health record systems to share information seamlessly, Yaraghi writes at Brookings’ TechTank. With the current lack of interoperability of EHRs, it seems highly unlikely the industry will be able to obtain a complete medical history of one million Americans, he writes. “To succeed, the Precision Medicine initiative has to either overcome the lack of interoperability problem in the nation’s health IT system or to find a way around it,” he writes. For now, those working on the project should get access to what medical records they can and then work with providers and vendors on gaining access to future records, Yaraghi says. When it comes to privacy for precision medicine, problems the administration will face include setting up secure technologies and privacy regulations surrounding the project so that information cannot be accessed by malicious actors. In addition, when researchers begin to analyze data, they may uncover information patients do not want shared or known. To ensure safety of information privacy, audits should be conducted by third parties, Yaraghi says. And if a data breach occurs, a patient’s participation in the study should be canceled and the patient should get financial compensation. Deprivation has a way of making you feel excessively thankful for even the most meager offering. Yoni Maisel, a reflective patient and patient advocate with a rare genetic primary immune deficiency disorder, conveyed just this sense of disproportionate gratitude in an exuberant recent piece describing the impact of technology on his life. Inspired by Eric Topol’s new book, The Patient Will See You Now, highlighting the power of the smartphone (my WSJ review here), Maisel went out and bought one. He then received (on his smartphone) an email from a doctor who had read about the symptoms Maisel had previously described on his blog related to a second, extremely rare disease he has (Sweet’s Syndrome), and thought she had a patient with a similar condition. After viewing photos of skin lesions Maisel took (with his smartphone) and shared with her (with his smartphone), the doctor was reportedly convinced her patient had Sweet’s Syndrome as well. On the one hand, of course, Maisel’s story obviously represents a terrific outcome for the newly-diagnosed patient, and – precisely as Maisel and Topol emphasize – highlights one way smartphone technology can improve medical care. At the same time, Maisel’s joy, paradoxically, also reminds us of a deep flaw in the system, as Valencia’s comment begins to suggest. At issue: poor data sharing, a medical tragedy of underappreciated dimension. Valuable, even vital information often remains uncaptured, unanalyzed, and, especially, unshared. The human consequences associated with poor data sharing were poignantly described by Seth Mnookin in his New Yorker article last year profiling a family whose son, Bertrand was born with a mysterious disease that eluded rapid identification. The family (like an estimated 25% of patients with unknown genetic disorders) was able to obtain a diagnosis by exome sequencing, yet struggled to locate others with a similar condition. It wasn’t until the father, Matt Might, blogged about it – and had the story picked up by Reddit and others – that he was able to locate others with the disease. The key point is that the networks afforded by Reddit were fundamentally richer than any medical dataset. If someone – the father in the Mnookin story, the doctor in Maisel’s story – wants to find others who have similar genetics and phenotypes, they need to rely on public, non-medically-specific networks because these networks, while not purpose-built, are nevertheless far denser, and often, it seems, the best option available. The issue this speaks to is what I’ve heard referred to as Matticalfe’s Law, named by physician and informaticist John Mattison to suggest a variant of the familiar Metcalfe’s Law. (Disclosure: while I’ve no business relationship with Mattison, he is co-chair of the Global Alliance for Genetics and Health eHealth working group, on which I serve. Also, to offer my usual reminder/disclosure, I am CMO at DNAnexus, a company that makes a cloud-based platform for genomic data management and collaboration). Metcalfe’s Law is the idea that the value of a network is proportional to the square of the number of participants – i.e. adding more people to a network increases value not linearly, but exponentially. It’s a key principle underlying the concept (and power) of networks (though not without its critics – see here). One implication here is that if every cancer center, every medical center, every rare disease center shared their data fully, then as a whole, these data would be profoundly more valuable and useful. The chances that a patient with an unusual mutation and phenotype would have someone like them, somewhere in the world, would be so much higher. So why isn’t this done? For starters, most hospitals – even leading centers — are struggling to meaningfully organize the genetic and phenotypic data of their own patients in a fashion that can truly inform clinical decision making, as I discussed late last year; thus, you can argue that it’s hard to share with others what you can barely grasp yourself. A second factor, of course is privacy; medical centers typically emphasize the special nature of medical data, and express concern about the fate of rich information in a shared dataset. “Isaac Kohane, a pediatric endocrinologist at Boston Children’s Hospital, told me that many researchers believe, incorrectly, that patient-privacy laws prohibit sharing useful information. In other words, even if top centers were able to collect and usefully organize phenotypic and genetic data on patients, would they share most of this information or silo it? Whether consciously recognized or not, these data are perceived as representing a competitive advantage for the institutions and individuals who generated them (and notably, in this context, the “generating individual” is understood to be the researcher, not the patient!). The need for rich data sharing to accelerate what Andy Grove calls “knowledge turns” (link here – ironically but not surprisingly, preview only; JAMA has not made this open access) has both frustrated and motivated patient advocates such as Chordoma Foundation co-founder Josh Sommer, who has worked tirelessly to change the system (see here, also here). Nevertheless, both in the context of scientific research and in the context of patient care, the unfortunate truth is that while it’s fashionable to profess commitment to data sharing, many hospitals, and many researchers, are reluctant to part with data. “What if you owned a business and one of your competitors said: ‘I would like a list of all your customers, as well as information on their demographics and health history.’ You would likely say, there is no way I’m giving you a list of my customers. Instead, the idea of the moment seems to be “federated” datasets – the idea that everyone can keep their own datasets, but query engines could specifically extract the exact, relatively limited data they need, affording, it’s suggested, many of the benefits of data pooling but without incurring many of the risks. There’s a conspicuous “assume a can opener” quality to this strategy, but it’s worth watching because some very smart people (and organizations) are working intensively on this — and because it might be the best we can hope for. One alternative to this idea is that patients could contribute their own data into datasets, which could be used for the common good. This is obviously attractive conceptually, but the challenge is more pragmatic: while some patients are both motivated and technologically adept, most patients struggle exhaustively just to get a handle on all of their own medical records, and most are unlikely to have the time, inclination, and ability to share – beneficial as this would be. While some patients might not like this approach, those in favor would vote with their feet, and I can imagine that the rich, consented dataset the subscribing, data-inhaling clinics would build would rapidly exceed those available elsewhere in the world. Perhaps at this point, holdout institutions – which I imagine would include top academic medical centers – would finally relent and join as well. The aspiration would be that in a world of rich data sharing, making diagnoses based on the combination of unusual symptoms and unusual genetics wouldn’t be exceptional, or even tweet-worthy; rather it would be — and should be — the expectation. Where Is HITECH’s $35 Billion Dollar Investment Going? On April 16, 2013, we released “REBOOT: Re-examining the Strategies Needed to Successfully Adopt Health IT ,” outlining concerns with implementation of the Health Information Technology and Economic and Clinical Health (HITECH) Act. Specifically, we asked: What have the American people gotten for their $35 billion dollar investment? Two years after releasing the white paper, and six years since enactment of the HITECH Act , the question remains. There is inconclusive evidence that the program has achieved its goals of increasing efficiency, reducing costs, and improving the quality of care. We have been candid about the key reason for the lackluster performance of this stimulus program: the lack of progress toward interoperability. Countless electronic health record vendors, hospital leaders, physicians, researchers, and thought leaders have told us time and again that interoperability is necessary to achieve the promise of a more efficient health system for patients, providers, and taxpayers. Instead, according to physician surveys , electronic health records (EHRs) are a leading cause of anxiety  for physicians across the country. The EHR products are not meaningful to physicians, which is clear when you consider that half of all physicians  will have their Medicare payments cut in 2015 for not adopting government benchmarks for EHRs. We were pleased that the Office of the National Coordinator for Health Information Technology (ONC) recognizes the concern of hospitals, providers, patients, and other stakeholders, and recently released a draft roadmap for interoperability. In it, ONC proposes  to work with stakeholders to develop minimal standards for the safe and secure exchange of EHRs. We appreciate ONC’s efforts to identify the steps necessary to achieve true interoperability of EHRs, but we are concerned that the draft speaks in generalities and does not address all of the concerns raised about interoperability in the REBOOT report. The ONC roadmap provides a framework for responsibility, governance, and accountability in regard to the future development and implementation of interoperable EHRs. But instead of offering specific objectives, deadlines, and action items, ONC’s roadmap falls short on the nitty gritty technology specifics that vendors and providers need when developing IT products. We are left with many outstanding questions about how to achieve interoperability and how to address the cost, oversight, privacy, and sustainability of the meaningful use program. A truly interoperable health system in local communities and across the country will enable physicians, hospitals, and other health care providers to seamlessly share patient information, such as medical histories or diagnostic tests, through a secure network. Sharing this information should improve care and reduce costs by allowing physicians to better coordinate care. For example, health information exchange between providers should prevent duplicative tests and harmful drug interactions. After spending $28 billion  so far of the $35 billion total taxpayer investment, significant progress toward interoperability has been elusive. Stage 1 of the meaningful use program failed to include any meaningful health information exchange requirements, and lacked a vision to achieve interoperability. Instead, Stage 1 incentivized the widespread adoption of EHR systems that providers now say are difficult to use and lack the ability to exchange information without costly upgrades. We are now well into Stage 2 of the Meaningful Use program and providers are struggling to meet even modest health information exchange requirements. According to a report  released by the Centers for Medicare and Medicaid Services (CMS) on February 10, 2015, only 131,905 out of more than 500,000—or roughly 25 percent—of eligible medical providers and hospitals had attested to either Stage 1 or Stage 2 for 2014. Responding to stakeholder feedback, CMS allowed more flexibility  to providers to meet Stage 2 requirements. By remaining in listening mode, ONC proposed high-level goals for how to achieve interoperability, like building on existing infrastructure and empowering individuals, but the roadmap fails to outline real and actionable next steps. It is not enough for ONC to identify factors it believes are important. It must also delineate how it will find specific solutions to these concerns. The HITECH Act was clear: ONC is supposed to certify EHRs that can meet the program requirements for the meaningful use of EHRs. Meaningful use of EHRs is supposed to deliver value to patients and physicians, but instead we have reports that have shown  that ONC certified products fail to deliver the value of easily exchangeable health information to better coordinate care. They are also incredibly expensive with no guarantee that providers purchasing certified products will achieve the Meaningful Use program requirements. Indeed, through the ONC certification program, ONC has had the ability to achieve interoperability, but instead ONC is still struggling. Nothing makes this point more clear than this fact: Stage 2 meaningful use was promised to be the stage when health providers were interoperable yet we are well into Stage 2 and ONC is just now releasing its vision for interoperability with a high level roadmap. We have seen many high-level documents on interoperability: the JASON reports, the Health IT Policy and Standards Committees’ reports, the Connecting Health and Care for the Nation: A 10-Year Vision to Achieve an Interoperable Health IT Infrastructure report, and the Federal Health IT Strategic Plan 2015-2020 report. All of these reports, as well as the ONC’s latest roadmap, are missing the same thing: practical and actionable steps to ensure a proper return on the American people’s investment. In 2009, the Congressional Budget Office (CBO) estimated  that fully integrated interoperability would save the Medicaid and Medicare programs $12.5 billion through 2019. These savings have yet to materialize and with 50 percent of doctors unable to meet current program requirements, it is unlikely that taxpayers will see these savings in the near future. Moreover, the number one complaint we hear from providers is the unexpected costs of maintaining and upgrading their systems. ONC does not describe how it will determine the costs associated with the adoption of expanding interoperable platforms. Nor does ONC explain how it would evaluate cost or incorporate cost control into the development and scaling of interoperability. Provider concerns about the cost of complying with the program should be addressed in the roadmap. We appreciate the notion  that as new models of care begin to reward providers for outcomes, changing incentives will reward interoperability. We agree. However, we live in the aftermath of the HITECH Act, where to date $28 billion have not resulted in significant improvements to clinical care coordination or quality. Without concrete immediate and long-term steps, tied into accurate, usable (and collectable) performance measures, we will continue to see a meager return on investment. One way to improve oversight of the program is to put in place measures to gauge success. ONC appears to be taking a step in the right direction by describing seven different lenses to measure and evaluate the quantity and quality of information flow within interoperable systems, such as who is exchanging information, and where and what type of information is being exchanged. However, without specific performance goals for each type of measurement, it is unclear how ONC will measure success. In addition to defining these metrics, effective oversight includes describing how the metrics will be collected, analyzed, reported, and used for decision making. The fiscal year 2015 Omnibus Appropriations Act required ONC to issue a report on information blocking — the practice that EHR vendors, and sometimes hospitals and physicians, use to prevent electronic information exchange as a way to gain a competitive advantage in the health care marketplace. The report will give Congress a better understanding of the extent to which information blocking happens and a comprehensive strategy on how to address it. It will also provide a good example of how ONC exercises its oversight responsibility. The security of patients’ personal health information in EHR systems is a real and immediate concern to us. According to a warning the Federal Bureau of Investigation (FBI) issued to health care providers in April 2014, the health care industry has the highest volume of cyber threats and the slowest response time. The industry “is not as resilient to cyber intrusions compared to the financial and retail sectors, therefore the possibility of increased cyber intrusions is likely,” the FBI stated . Unlike a credit card number, the information contained in a patient’s health record is impossible to reissue. Health records contain financial records, personal information, medical history, and family contacts — enough information to steal and build a full identity or use for valuable research purposes. The ONC roadmap describes collaboration across several government agencies to accomplish their security goals. It says the Department of Health and Human Services will work with the Office of Civil Rights and industry to develop and propose a uniform approach to developing and enforcing cybersecurity in health care in concert with enforcement of HIPAA Rules. However, the roadmap lacks clear, obtainable goals regarding security requirements and implementation. Additionally, the costs for our future security infrastructure are unknown, as well as who will pay for it. As new cyber threats emerge every day, this administration must answer these questions quickly. The recent hack on a major health insurer that compromised personal information, including Social Security numbers and health histories, of tens of millions of Americans highlights the urgent need for an appropriate framework to protect patient privacy. The long-term sustainability of EHR systems remains one of the biggest unknowns. ONC’s roadmap is surprisingly silent on this topic, which is stunning considering that there is only $7 billion in funding left from the HITECH Act. While the President’s Budget does request a significant increase in funding for ONC, the administration seems to ignore the reality that taxpayers have already committed billions of dollars toward a goal that is still vague. According to ONC , implementing EHR systems range from $15,000 to $70,000 per provider. According to a September 2014 IBIS World Report on EHRs, nearly 45 percent of physicians from the national survey reported spending more than $100,000 on a system. About 77 percent of the largest practices spent nearly $200,000 on their systems. However, even these estimates fail to consider upgrade and vendor costs associated with running these systems. Numerous stakeholders have stated that one large obstacle to interoperability and sustainability is the cost  of sharing data among different vendors. ONC envisioned  the State Health Information Exchange Program would help facilitate this exchange, and taxpayers spent over $500 million on this effort. Yet, the program has failed to provide a long-term approach to information exchange. According to a RAND Study  published in December 2014, only about 25 percent of the nation’s health information exchanges are considered financially stable by those who run them. These programs’ inability to sustain operations without federal funding triggers more questions. With HITECH Act funding dwindling, we fear that time is running out for ONC to make meaningful advancements toward interoperability. In listening to the concerns from EHR vendors and EHR users from across the care continuum, ONC has taken an important turn under the leadership of Dr. Karen DeSalvo. The previous ONC leadership did not understand the difficulty and enormity of creating government-approved products in a market that struggled to exist before government incentives arrived. As a result, our nation’s health care providers are stuck with the huge cost of unwieldy systems trying to conform to government mandates. They are stuck adopting EHR systems which don’t fit into their established workflows. And if they actually want to share their patients’ data, they are stuck with even more costs imposed by vendors. At the center of all this is the patient who must sit quietly in the exam room looking at her physician use a computer instead of directly talking with her, who likely has seen no better access to her own data, and who is struggling to understand why her doctor has such a difficult time getting her lab results. That the ONC roadmap recognizes these concerns is a welcome change. High-level ideas are important, but we are concerned that without specific requirements and action items, we will not advance towards the goal of improving health care coordination and patient care, which was the intent of the HITECH Act. 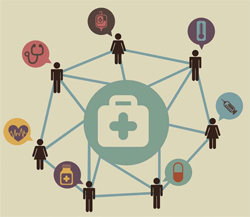 The Office of the National Coordinator for Health IT has released for public comment its shared nationwide roadmap for interoperability. The roadmap’s goal is to provide steps to be taken in both the private and public sectors to create an interoperable health IT ecosystem over the next 10 years, according to ONC. In addition, the roadmap is also linked with President Barack Obama’s recently announcement Precision Medicine Initiative, which aims to increase the use of personalized information in healthcare, ONC announced. The roadmap is garnering praise from industry leaders, including from the College of Healthcare Information Management Executives. CHIME said in an annocement that is “welcomes” the Interoperability Standards Advisory today as part of the roadmap. The draft road map stems from, and is a more robust version of, a vision paper published in June by ONC. The ultimate goal of ONC in developing the road map is to build a continuous learning health system. The interoperability roadmap is also part of the ONC’s overarching Federal Health IT Strategic Plan, which spans from 2015 to 2020. “As a draft, this roadmap needs the input from knowledgeable, engaged stakeholders and, in particular, areas where important actions or milestones may be missing,” according to ONC. While health providers praise the ONC’s interoperability vision, they’re demanding increased standardization and an accelerated roadmap to achieve the Triple Aim. Interoperability was supposed to be a centerpiece of Stage 2 of the Meaningful Use (MU) EHR incentive program, but hospitals and physicians practices nationwide are finding out just how hard it is to achieve that goal. Through the end of August, a mere 25 hospitals and 1,277 eligible professionals had attested to Stage 2 on the Medicare side of the program, according to CMS. A KLAS Enterprises report, released in October, found that although 82 percent of the 220 providers interviewed thought that they were at least “moderately successful” with interoperability, a mere 6 percent said they were at an “advanced” level. And just 20 percent were “optimistic” about health IT vendors’ efforts to collaborate on interoperability. In the same week, the Office of the National Coordinator for Health Information Technology submitted its annual report to Congress, highlighting some of the problems. “Electronic health information is not yet sufficiently standardized to allow seamless interoperability, as it is still inconsistently expressed through technical and medical vocabulary, structure, and format, thereby limiting the potential uses of the information to improve health and care,” the report said. Days later, ONC released an update of its proposed 10-year roadmap to interoperability, a document that will be finalized in 2015. Like the earlier draft, this version put interoperability front and center on the office’s three-year agenda, while harnessing this information to improve care and lower cost was part of the sixyear plan. This effectively pushes a main goal of Stage 2 into the third stage of MU, which will not start before 2017, and suggests that the bulk of the nation’s healthcare providers won’t achieve the “Triple Aim” until after the incentive money is gone. ONC’s Health IT Policy Committee and Health IT Standards Committee also approved recommendations from a task force of an independent scientific advisory group known as JASON (not an acronym, but a reference to a character in Greek mythology) to build interoperability around application programming interfaces (APIs). Together, the moves have gotten mixed reviews. Branzell wondered how hospitals are supposed to balance the longer-term vision for interoperability with an MU timeline that penalizes noncompliant providers starting in 2015. “There still are some pieces fundamentally missing,” Branzell said. He believes there should be “clearly enforceable standards” for patient matching, as well as “specific data standards that are enforceable down to the nomenclature number.” Not having standards — standards that are kept current — adds to the complexity of health information exchange by offering too many choices that are not always compatible with each other, according to Branzell. The CHIME chief continued, calling patient matching “the cornerstone of not only effective patient exchange but also patient safety.” He would like at least a standardized patient matching requirement, if not a national patient identifier; a national ID has been politically taboo since at least 1998, even though the original 1996 HIPAA statute called for one. The API idea is proving popular at the policy level. At a Washington, D.C. healthcare conference put on by U.S. News & World Report in October, Micky Tripathi, founding president and CEO of the Massachusetts eHealth Collaborative; Jennifer Covich Bordenick, CEO of eHealth Initiative; and Steven Posnack, director of ONC’s Office of Standards and Technology, all spoke in favor of greater availability of APIs in healthcare. After all, it has become common for facilitating interoperability in so many other industries. “Kendall Square [in Cambridge, MA] and Silicon Valley are laughing at us,” said Tripathi. Later, at the same event, then-National Health IT Coordinator Dr. Karen DeSalvo, said that EHRs would have limited impact on the quality of care in the absence of greater interoperability. In the real world of healthcare, providers are getting creative, though some still want more clarity from Washington or from the health IT industry. Gulfport (MS) Memorial Hospital replaced its legacy EHR with a Cerner system that went live in June. Three months later, CIO Gene Thomas said that his most difficult task was migrating data to Cerner. Addressing HIE Via Common Vendor Platforms Memorial Health System in Springfield, IL approached interoperability in what CIO Dr. David Graham called a “reverse way,” with private practices bringing data to the organization’s primary care group. Like so many other providers, Memorial is building a health information exchange among nearby organizations that have a common vendor, in this case, Allscripts Healthcare Solutions. Memorial has been rolling out the Allscripts TouchWorks EHR at its own clinics this year and is installing an Allscripts interoperability platform called FollowMyHealth. The precursor of FollowMyHealth, called Jardogs, was incubated at the Springfield Clinic, a partner of Memorial Health System, prior to Allscripts acquiring the technology in early 2013. Another partner, the Southern Illinois University School of Medicine, also is transitioning to TouchWorks for ambulatory clinics, Graham said. “We are competing practices using the same database and the same instance of TouchWorks,” he said. Memorial also collaborates with a federally qualified health center (FQHC). When that safety-net facility refers patients to the Springfield Clinic or the SIU School of Medicine, information from a NextGen Healthcare Information Systems EHR flows into a common portal that care managers can access to reach out to high-risk patients, Graham said. “The other benefit of it is that then you can put that data in front of the physician,” Graham said. It’s not full interoperability, but it’s a start. A much larger healthcare system, San Francisco-based Dignity Health, has made interoperability a major component of a massive IT program. Dignity Health, formerly known as Catholic Healthcare West, was the launch customer for AirStrip One, a product from San Antonio-based AirStrip Technologies that delivers data from EHRs, patient monitors, and medical devices to clinicians on their mobile phones and tablets. Dignity also made an unspecified investment in AirStrip in August. AirStrip OB, an obstetrics module, is in nearly every one of Dignity Health’s hospitals, and the health system also has begun using AirStrip’s cardiology product. “What we are envisioning is that we will get AirStrip in the hands of all of our physicians,” said Lundquist, a family physician in Camarillo, CA, who practices about one day a week. He expects to have secure clinician messaging within the apps as well. There are a lot of physicians to reach. Dignity Health has approximately 1,200 employed physicians and 2,000 to 3,000 “clinically integrated” aligned physicians among its total medical staff of more than 10,000, according to Lundquist. “Our health system, like many others, relies on independent physicians to support our work,” he said. Meanwhile, Dignity is about two-thirds of the way through migrating its hospitals to a Cerner EHR from an older system. Dignity Health Medical Foundation in California and several practices in the Phoenix area all run an Allscripts EHR, though Lundquist said there is “some variability” among those Allscripts installations. Dignity has built a private health information exchange on the MobileMD platform, technology that Siemens bought in 2011 and now is in the process of selling to Cerner as part of the latter’s $1.3 billion acquisition of Siemens’ health IT business. More than 7,000 physicians across all of Dignity’s markets are connected, according to Lundquist. “In most cases, that allows them to access hospital information,” he said. However, most of the data flow is one-way, though some employed physicians do have bidirectional exchange with Dignity Health hospitals. According to Lundquist, this is more a legal issue than a technical one. “Who owns it? Does it become part of the [patient’s] legal record? Do you become an HIO?” he wonders. Dignity Health’s system connects with many national, standard HIE connections and exchanges data with the UC-Davis Medical Center and, according to Lundquist, is exploring a relationship with UC-San Francisco. He expects Dignity to participate in some fashion in California’s statewide HIE known as the California Integrated Data Exchange, or Cal INDEX. Physicians seem to welcome the efforts, as long as HIE fits workflow and makes practitioners more efficient. “I haven’t seen any resistance from physicians when we give them data,” Lundquist said. Eventually, he would like to push alerts to clinicians to encourage early interventions with high-risk patients. “There needs to be a benefit to the doctor and the patient for them to do something outside their traditional workflow,” Lundquist said. Stage 1, which about 90 percent of hospitals and 70 percent of individual clinicians in the U.S. have met, was about getting EHRs in place. With that in mind, CHIME’s Branzell is optimistic. “We have a lot of exchange going on in a lot of places that wasn’t there 4 to 5 years ago,” he said. “We’re building a house. We’ve got a beautiful foundation now,” Branzell said. “But you can’t live in a foundation.” Right now, the nation’s healthcare organizations are “just starting to put up the walls,” he added. “Huge gains in efficiency and safety were not supposed to come until post-Stage 3,” Branzell said. That will be in about 2020, or the sixth year of ONC’s new 10-year vision. “It’s not all doom and gloom,” Branzell said.